There are feathers everywhere in my apartment, from little gray or green ones to large white ones. Do I mind this extra mess? Not even a little bit! It signals the end of breeding season, which is a beautiful thing. Of course, the one rule I have learned when it comes to parrots, is that there are no rules, only guidelines. So I will keep my fingers crossed that there are no more temper tantrums, unruly behaviors or diva-like dramatics from my cockatoos. 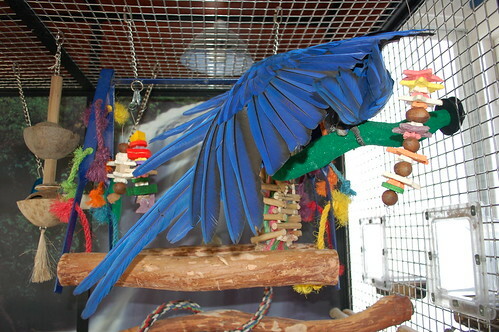 Molting is an annual exchange of feathers, out with the old and in with the new, typically following breeding season. Feathers are replaced year round, as you might have noticed when a clipped flight feather magically becomes whole again, but the big molt will follow breeding season. As usual, nature has things well under control. Because both egg and feather production take so many nutrients from the hen’s body, they won’t occur at the same time so as not to be too depleting. There are many birds that line their nests with feathers molted after the eggs are laid and prior to hatching. It’s a good system. As feathers regrow, they poke through the skin as a prickly little stubs covered in a keratin sheath. These are known as pin feathers and are uncomfortable to the bird if they are bumped or pinched. My umbrella cockatoo’s head is currently covered with them and I try to use a gentle touch during cuddle time. He lets me know if I have been careless. Yours will too. Some birds get a little moody during this new growth period, but it is short lived and generally mild. You will notice that there is a blood supply at the base of the new feather. This blood supply delivers the nutrients needed for the continued growth of that feather, and recedes as soon as the feather is fully developed. 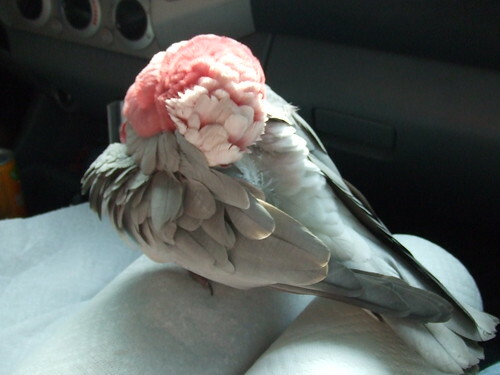 If yours is a un-mated bird, you will have to preen the areas that he can’t reach, such as the head and parts of the neck, by removing the sheathing around the new feathers. This can be a great bonding experience between you and your parrot. During this time, a diet rich in vitamin A and calcium is a good way to help him with feather production. Orange vegetables like sweet potato and carrots and scrambled eggs, shell and all, are good sources of calcium. Frequent bathing and misting will help keep the irritating itching to a minimum. 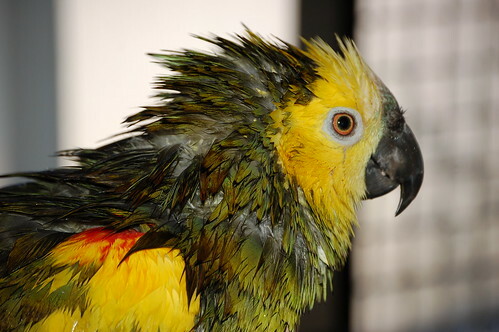 Stress, injury, illness and poor nutrition can interfere with, or prevent, your birds molting process. My umbrella cockatoo missed an entire molt last summer following an illness. Many of his feathers were raggedy and worn looking by the time he replaced them this year. Check to see that the new feathers have grown in without abnormalities in color, markings and condition. When a bird molts a wing feather, he will automatically molt the corresponding feather on the other wing to provide a balance and stability during flight. Feathers comprise 10% of a bird’s body weight and they weight 3 times as much as their skeleton. Even a small bird like the parakeet has between 2000 and 3000 feathers on its body. Small birds can have their first molt weeks after fledging, while larger birds might not molt until 9 or 10 months of age.